Episode Review: LEVERAGE, "The Hot Potato Job"
After a string of episodes that were outside of the box, Leverage went back to the well and gave us "The Hot Potato Job" which had a very familiar feel to it. This week's outing was not as strong as say "The 15 Minutes Job", but it still was a fine episode of television. The Crew was hired to help a well meaning crop sciences major deal with a big, bad agriculture company that was trying to push her around. You see, Emily came up with a super potato that could help thousands of children get the proper nutrition that they need. Since most of those who need this kind of assistance do not have a lot of money, she was going to give her invention away, but the ag corporation had other ideas. After trying to physically intimidate Emily into giving up her potato, they ended up threatening to sue her for copyright infringement since she "used" their seed to create the super spud. Since she didn't want to risk everything in a legal battle, she gave in and gave up the tuber. So once again, the Leverage Crew had to take on big agriculture (like in last season's "The Inside Job"). Instead of stopping a worldwide epidemic that would have wiped out massive amounts of crops, they were back to helping the little guy. We got another round of them duping office workers and CEOs, Eliot beating up people, Parker breaking into vaults, and the day being saved. Pretty standard stuff. "The Hot Potato Job" was by no means a ground breaking episode of Leverage. We've seen these kinds of clients, marks, and jobs before. Luckily, the writers and producers worked in the evolution of Nate and Sophie's relationship which kept things feeling fresh. I've never been too invested in these two as a couple (Parker and Hardison will always been my Leverage ship of choice), but seeing them deal with the ramifications caused by their San Lorenzo hook-up has been entertaining enough...for now. I never knew big agriculture was such a shady industry, but I guess it makes sense when food supplies are involved. Swapping the broadcast order and airing "Van Gogh" before "Hot Potato" was a good call on the show's part. For some reason Parker eating cereal is just the cutest thing in the world. Those country shots screamed Oregon. I miss being up there. We didn't get a lot of laughs last week, but the jokes were flying this time around. Especially between Eliot and Hardison. I'd love to see more of Eliot and Sophie's bond, and I bet there's more going on there than meets the eye. Eliot tackling people will always be funny. That explosion was way too over the top and reminded me of the Eliot/Matrix scene from Season 2. 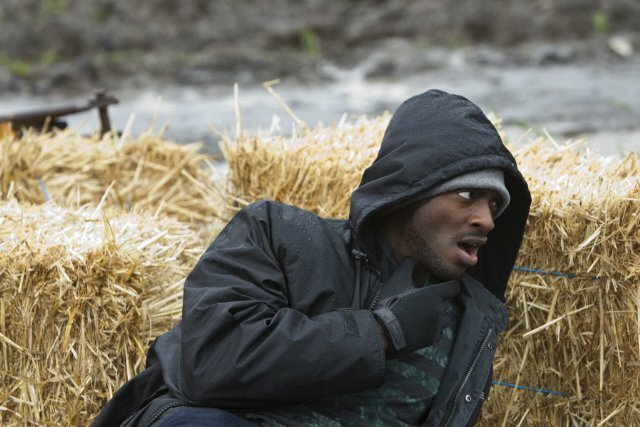 At first I was not on board with Nate and Hardison letting the kid watch them during the job, but that final scene between him and Hardison was oddly sweet. We're in desperate need of a real Big Bad this season because I could not muster any emotion one way or the other about tonight's generic and corrupt business people. I can't even remember their names. "I keep telling him he can't fake country." "That's my girl man!" "Stop! Don't teach people how to do that." "I really like Eliot/Sophie. Can you do Nate/me? No, Nate/you?" "A good lift in three years. Awesome!" "A little problem with authority? Yeah, I can relate." Leverage was bound to go back to its tried and true approach after something as different as "The Van Gogh Job", and "The Hot Potato Job" was a fine example of what this show does best. I just guess I've been spoiled by the recent out-of-the-box episodes the show's been giving us. Don't get me wrong, I'm still a fan of the show's escapist/procedural style, but I hope they keep mixing things up for the rest of this season.